Season the fiesta of your dear ones in a remarkable way by delivering our Lip-smacking Motichur Laddoos from Haldiram / Reputed Sweet Shop. Our 1 Kg (Gross Weight) Motichur Laddoos are really irresistible and are sure to captivate your loved ones. Season the fiesta of your dear ones in a remarkable way by delivering our Lip-smacking Motichur Laddoos from Haldiram / Reputed Sweet Shop. Our 1/2 Kg (Gross Weight) Motichur Laddoos are really irresistible and are sure to captivate your loved ones. Motichur Ladoo 1 Kg. 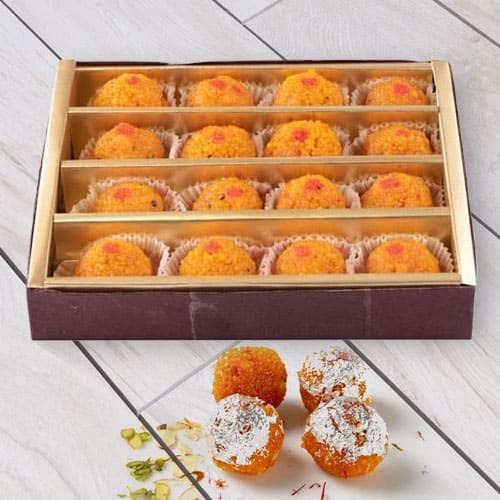 (Gross Weight) Laddoos are really irresistable, drawing everyone towards themselves.Relish your taste buds with these delicious motichur laddoos from Haldiram / Reputed Sweet Shop.